Edinburgh based company Vert Rotors, manufacturers of the world’s smallest and most powerful air compressors, has appointed Geoff Kermode as Head of Research and Development. Kermode, an expert in the design, development and implementation of high-value manufactured products, joins the company to drive Vert’s pioneering technology towards a range of significant applications with clear potential benefits across a huge range of industrial sectors. He brings with him valuable experience from his time at Bosch Rexroth Ltd, where he managed multinational projects and delivered substantial improvements to their hydraulic motors. Latterly he worked at MacTaggart Scott & Co. Ltd, where he led projects on bespoke high-precision equipment for specialised naval applications. Kermode commented: “I’ve kept my eye on Vert Rotors for the last few years, and was thrilled when an opportunity arose to join the team. “As an engineer, it’s very interesting to work with Vert’s disruptive compressor technology, which offers significant advantages to a number of different markets, from satellites to supercars. I’m confident my experience will help the company mature and develop this technology even further, and create bespoke solutions for a diverse portfolio of clients. Vert Rotors has developed a new kind of conical screw compressor that is more compact and powerful than any other device of this size. Their compressors operate at extremely low levels of noise and vibration, while remaining incredibly powerful. 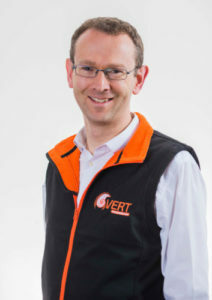 Olly Dmitriev, CEO at Vert Rotors, explains: “We are delighted that Geoff has joined the company. He understands the significance of our industry-first technology, and shares our passion to innovate and shake up the long established and somewhat stale compressor industry. Vert Rotors’ pioneering range of air compressors are designed for aviation, space, medical and other high-performance applications where dimensions and weight are crucial considerations. The company has already attracted international attention. Three-quarters of Vert Rotors’ customers are based outside the UK and include Fortune 500 manufacturers in the European Union and the United States.